Fassinating Fassbender - A Michael Fassbender Fan Blog: A Fassinating Store is Now Open! A Fassinating Store is Now Open! Mug with a Michael quote. As mentioned a month ago, I was thinking about opening up an online store representing items for sale in support of Michael Fassbender and the blog. In celebration of the upcoming 4th anniversary of Fassinating Fassbender (September 8th), the opening of A Fassinating Store could not come at a better time. As you see, here at just two items of nearly a dozen I created last night from a spontaneous burst of fassy fangurl power energy. I think all the items available thus far are pretty cool, but maybe one or two items may catch your interest at this time. As time allows, I will most certainly add to the store and I would love your assistance in making A Fassinating Store even more fassinating. How can you do that? Well as you must realize, we can only use original images of Michael taken by fans. So if you would like to contribute a clear image of Michael, alone (cropped to remove other people), that you took personally, please email me so we can discuss. Also, if you draw or sketch Michael as who he is, or in character and you would like to contribute that, I am definitely interested in hearing from you. *If your photo or design is accepted, it will become the property of A Fassinating Store, however, you will get designer credit in the description and a voucher towards the purchase of an item of your choice*. Feedback and comments are greatly appreciated, and I am especially interested in quotes that you fancy that Michael has said in person, or as a character, that you would like to see on some of the merchandise. As I was creating some of the designs last night, I started out simple, that way, it could appeal to more people. I used the blog URL frequently as I reckon people who would buy from the store, come to the blog frequently. 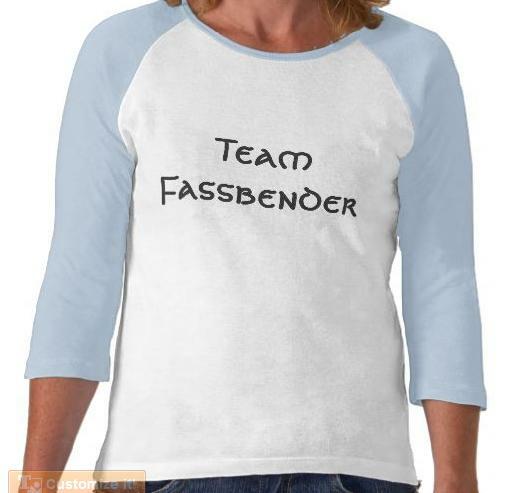 The 'Team Fassbender' title is a popular 'Team X' meme for t-shirts in support of a celebrity, especially to just simply show unity and dedication to said celebrity, regardless of gossip or whatnot. It's a cool team spirit kind of thing going on. A Fassinating Store is all about Michael only, no images or references to co-stars, friends, girlfriends, family, etc., will be permitted. Also, please note on some of the items, I have provided to you as the customer, the option to customize a t-shirt or mug based on the style/size that you want. Of the t-shirts, there are two different fonts, one is a rocker type font, as we know Michael loves rock/heavy metal music, and the other is a 'celtic' themed font. The t-shirts come in all sizes for females and males. 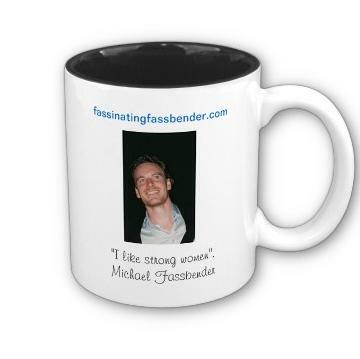 The mugs have a lot of variety too, and the styles range from two that have an image of a photo I took of Michael when I first met him at TIFF in 2008, and the other style is simply, and my favorite "FassinatingFassbender.com Drink and be Fassy! ", so I'm going to order than for myself, and a notebook. The images of Michael I used were from TIFF 2011. I have used zazzle.com for my job and their quality is excellent, and fast service. 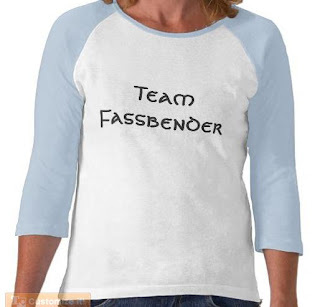 I hope you all come to enjoy this new Fassinating Fassbender adventure as this offers us all an opportunity to buy customized Michael Fassbender accessories designed by me, and in the future, by YOU too. Per each sale, I only receive 10%, so it's not going to be a huge money maker, but it will be a nice little piece of profit to help me with the administration of all my various FF projects. That's great, Simone! I'll think of my favourite quotes (there are many of them!). My husband has already drawn a portrait of Michael for me, I'll ask him if I can send it to you. Maybe he could draw another one if I ask him! I'll think about all that and I'll tell you! Brb I'll check it out and see what I'll buy. Hey kt, that's great feedback about zazzle, and I too know first hand the quality of their work for a special order I did for an event at work during the Olympics. I like that 'crazy' quote from Michael, and I was thinking about that too. That would go well on a canvas bag, mug, etc. My "personal" pic of Michael taken in Paris was actually taken by a girl I was with. I'm not sure how she would react if we used her pic for the store? I'd like some quotes from Hunger, for instance: "Bit of a break from smoking the Bible, hey? Have you worked out which book is the best smoke? - We only go for "lamentations" ". Or " You could learn to relax too. -Maybe, you never know, never tried it before". Or some lines of Shame. That is lovely Emilie! I will get to work on it and see what we can do with it.